It seems to be a good time for bel canto visions of Queen Elizabeth I, English Touring Opera's new production of Rossini's Elisabetta Regina d'Inghilterra is in the middle of a tour [see my review], and Welsh National Opera (WNO) has revived Alessandro Talevi's terrific 2013 production of Donizetti's Roberto Devereux, similarly on tour [see my review from 2013]. 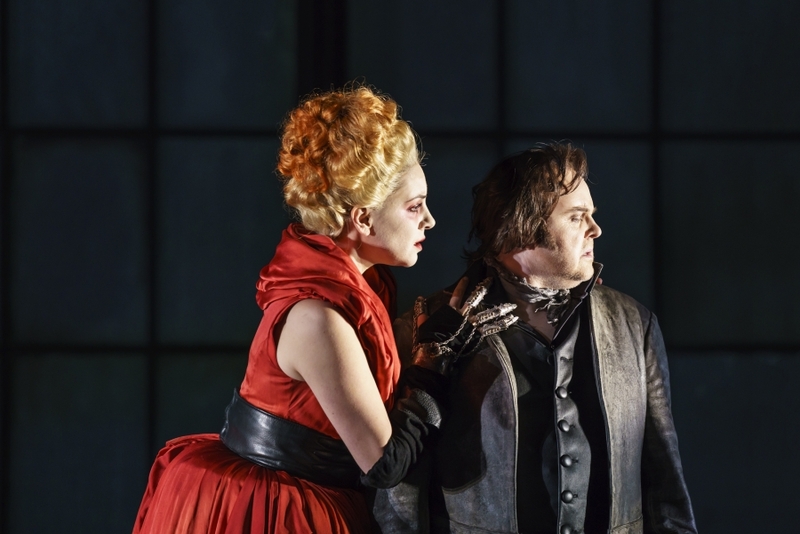 We caught WNO's revival of Donizetti's Robert Devereux at Milton Keynes Theatre on Friday 29 March 2019, with Joyce El-Khoury as Elisabetta, Barry Banks as Robert Devereux, Justina Gringytė as Sara and Roland Wood as the Duke of Nottingham, conducted by James Southall. The run opened in Cardiff earlier this month, and there are cast changes during the round so this performance was both Roland Wood's debut in the production and the first performance conducted by James Southall. Directed by Alessandro Talevi, with Alicia Frost as the staff director, the production featured designs by Madeleine Boyd, lighting originally by Matthew Haskins realised on tour by Benjamin Naylor and movement by Maxine Braham. 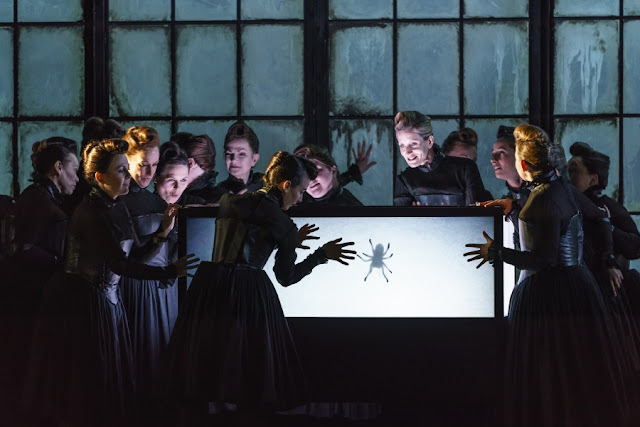 Whilst Salvatore Cammarano's libretto, based on a place by Francois Ancelot, provides a terrific picture of the ageing queen the details of the plot are completely a-historical and using an historical approach to the opera is probably hardly helpful. Instead, Talevi and Boyd channel a number of influences, Vivienne Westwood for the queen herself and Paula Rego for the look of the female courtiers, concentrating on the sense of Elizabeth as the dangerous centre of the court, with perhaps a sort of steam-punk -Louise Bourgeois for the spider machine! Essential to this was the image of the poisonous spider, an image which threaded its way through the entire opera, at first simply as images of spiders but in the crucial Act Two scene when Elizabeth explodes at Roberto she mounts a real spider-like machine manipulated by her women. And Roberto's prison scene sees him also entangled in what could be a spider's web. 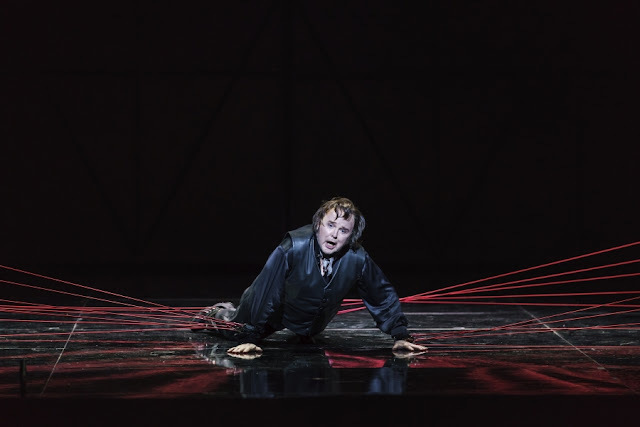 The original production coupled this distinctive vision with strong central performances, and it was to WNO's credit that this revival had been equally strongly cast so that we were again swept viscerally into the opera's world. The performance from Joyce El-Khoury was astonishing. I was familiar with her work mainly as a result of the recordings and performances she has done for Opera Rara [her recording of Donizetti's L'ange de Nisida has just been released] where she seemed to play rather droopy heroines. Here as Elisabetta she was a positive spitfire. The voice still flowing stylishly around the busy passagework and fearsome coloratura, but added to it was a real steeliness and intensity of tone. This sense of vivid vocal acting was combined with strong visuals so that in Act One she really did establish this Queen as a dominant character, fearsome yet needy, bravura yet intense, both musically and visually stimulating. 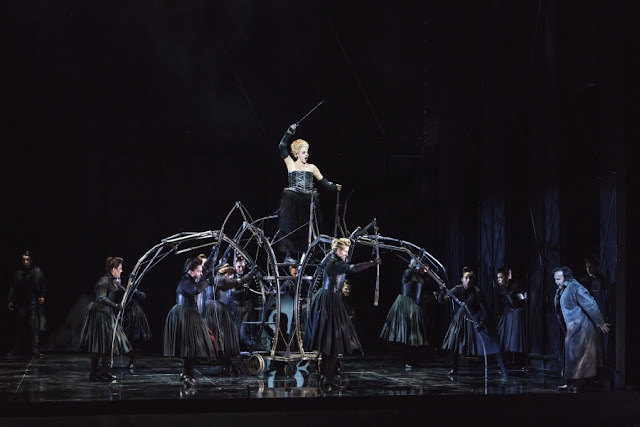 Through the opera we get a real sense of Elisabetta the person behind the mask, the woman manipulating the spider. And this unfolded brilliantly in the final scene where, now bald, El-Khoury steps down from the spider machine as she abandons all hope, and finally abandons life. El-Khoury was fantastically supported by the rest of the cast. Barry Banks brought oodles of dashing tone to the role of Roberto, the cad incarnate who woos one woman whilst claiming only to love another. Banks brilliantly projected Roberto's virile ardour, this was singing was was bravura indeed, striking sparks off El-Khoury, whilst able to whisper (metaphorically) sweet nothings of Justina Gringytė's Sara. 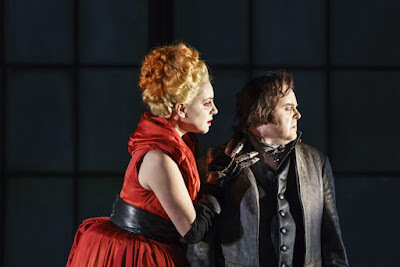 Having sung in WNO's production of Verdi's La forza del destino last year [see my review], Gringytė impressed with her flexibility in singing this bel canto role. 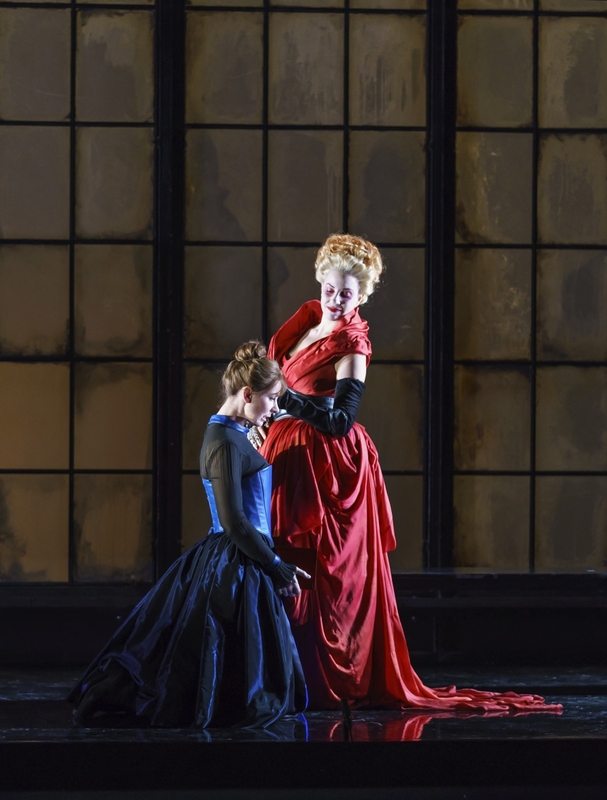 Her Sara was indeed beautifully sung, with Gringytė bringing a vibrancy to the performance which helped make the rather droopy character into something vividly etched. She and Banks had a completely intense duet, and Gringytė made Sara's small, final appearance at the end really count. Having been singing one cuckolded man, in WNO's current production of Verdi's Un ballo in maschera [see my review], Roland Wood took over another and made the Duke of Nottingham into something noble and distinguished, with just the right sort of vicious edge when he realises quite what his friend and his wife have been up to! The supporting cast were all up to the same standard, though in this production it is tricky to tell Cecil, Raleigh, the Page and Nottingham's confidante from each other but their role was to facilitate the drama and Robyn Lyn Evans, George Newton-Fitzgerald (a member of the WNO chorus), Wyn Pencarreg and Philip Smith did admirably. The chorus was, as usual, on terrific form though Donizetti does not give them really enough to do. Conductor James Southall showed that he doesn't just know the music [as a WNO repetiteur he has probably bashed through it plenty of times on the piano] but loves it and understands it. It is difficult to take seriously an overture which includes a variation of 'God Save the Queen' [Donizetti wrote it for the Paris production of Roberto Devereux in 1838] but Southall did and drew a performance of striking drama from the orchestra. Throughout he showed a nice tendency to push the more dramatic sections, creating some vivid moments, whilst giving the singers space in gentler passages. This created a feeling of urgency in the drama which matched the performance, whilst never making us think it was over-metronomic or rushed. This was our first visit to the Milton Keynes Theatre, and it turns out that it is an ideal size for this type of music. Despite the large open piece, balance between stage and orchestra was excellent and the drama came over with virtuosity and vividness. All in all, a terrific revival.